Taylor Hall enters his 5th NHL season as one of the most dangerous scorers in the NHL, but the 22-year-old spent the summer analyzing his game in hopes of becoming even more dominant this season. How much better can he be? According to the first overall pick in 2010, he can improve significantly. finished product,” responded Hall when I asked him where he feels his game is at. He spent the summer getting stronger, but also watching video from last season and picking out aspects of his game that he wants to improve. 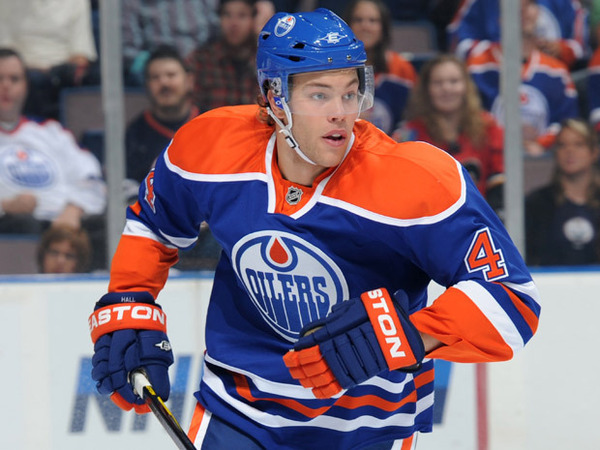 and as far as being a big part of our Oilers offense,” said Hall. I asked him to elaborate on what parts of his game he watched on film. those and try to raise my shooting percentage a little bit. all of that stuff at the right time I feel I can be a difference maker,” Hall said. He also discussed entering battles smarter and using better body position. “I’d go into battles off balance or recklessly and I’d end up falling. I was leaning in and leading with my stick too much. I want to enter those frays with better body position. I’m the same weight as last year, but I’m much stronger. I lifted heavier weights this year and that should help me in those battles. I worked a lot on getting better body position. It is a small part of the game that should really help me control the puck better,” said the Oilers leading scorer. In the second half of last season, I noticed Hall was much more focused on back pressure. He used his impressive speed to break up plays at the Oilers blueline, and often transitioned the puck back up ice. Was this a conscious decision on his part, or did someone point out that weakness in his game? the year because I am a slow starter, and I feel like that might be a reason why,” Hall. Hall had 3 goals and 8 points in his first 9 games last season, before he was injured. Hall had 2 goals and 10 points in the first 10 games after the lockout, yet he believes he’s a slow starter. people want to blame the goalies and stuff, I think I was a big part of that,” he explained. Hall spoke like a player who was determined to make more of an impact on the ice. He desperately wants to win, and I sensed he believes he can be a difference maker in both ends of the rink. Because he has the puck so much, he’ll turn it over, most puck carriers do, but this was the most excited I’ve seen Hall talk about his play away from the puck. He’s coming off a career-year in points, but feels he has so much more to give. He also spoke candidly about feeling much more comfortable heading into camp this season. the right mindset so I’m excited,” stated Hall. I never liked the centre experiment. The best time to have tried it would have been during the lockout when Hall was playing in the AHL, but coming off of a shoulder injury he wasn’t keen on the idea, so they didn’t try it. Last year, Eakins came in and he wanted to see for himself if Hall could work at centre. Luckily it was a short-lived experiment. The Oilers still have major question marks at centre, but they’ve realized that moving their best player to a new position isn’t the best way to solve the centre dilemma. Hall also brought up the importance of dealing with the same head coach heading into camp. there’s not that awkwardness when I see him next. comfortable this year than last,” said Hall. Throughout our conversation Hall was constantly talking about us, we and the team. Personal stats are nice, but he wants to win, and it is clear he realizes that the better he plays in both ends of the rink, the higher the chances are of the Oilers having success. I’m not sure his improved overall play will be enough to lead the Oilers to the playoffs, but if his teammates follow his lead and decide to analyze the weaknesses of their games, and focus on improving those areas, the Oilers should be a much more competitive team than we’ve seen over the past five seasons. At the very least, it should be very exciting for Oilers fans to watch the evolution of Hall. Giroux (134) and Phil Kessel (132). (1.15), Steven Stamkos (1.14) and Getzlaf (1.12). the elite offensive scorers in the league, so how much better can be be with a more intense focus on being a complete player? I’m curious to find out. Ramsay, Hall and pre camp notes. West preview: What now Vancouver? West preview: Can the Flames score? West preview: Can the Jets surpass 84 points? Trade him for a back up goalie while his value is high! Imagine if HALLywood had a decent centre !!!! The compete level of this team is whatvim going to be closely watching this year. Its real simple. With the amount of talent this team has if they compete harder theyll win more games. Too many times last season they started a game carrying the play oly to give up a deflating goal (cough DUBNYK cough cough) and fold like a cheap tent. Hall should be Captain now. Get rid of Ference, that socialist (NDP meetings) and environmentalist (the groups he associates with want our energy industry shut down). Ference doesn’t represent Edmonton valves anyway. Are you sure the Ndp are Alberta’s problem or the pc’s and liberals? I have seen or country sold off to corporations by the pc’s and liberals the last thirty years and what do we have to show for it? You sound like your part of the problem. It sounds like Ference is part of the solution. Good grief. Nothing has been “sold off”. What a pile of socialist drivel. A diverse economy with many employers in almost all industries versus one or two crown corps run by bungling bureaucrats. Which has resulted in considerably more jobs which, in turn results in a more robust tax base and higher tax revenue. Well, not being a plumber or pump technician, I’m not really sure Edmonton’s VALVES are really in Ference’s influence. I could care less what he does off-ice. I just hope he does not become such a darling of the MSM that it stops MacT and Eakins moving him off the roster when his due by date swings around in the not too distant future. I’ve lived in Edmonton most of my life. I love the environment. River Valley to Clover Bar Dump with all its technology to recycle waste.The federal NDP and Provincial NDP do have ties. But to say that the NDP are anti-energy is stupid. I am card carrying Conservative. And even I know that the Provincial NDP would not ever slow Oil sands development. Make it cleaner. More environmentally friendly sure. But anti-energy never. I myself would like to see Big Oil do more long term to have less impact on the land. In conjunction though with the Provincial and Federal governments. Ference grew up in Alberta. He is as much an Edmontonian as you or I. When hacking someone on this site we should stick to their play on the ice. We are better than this statement by Total points. There’s a mean streak in there somewhere that should soon come out. He seems to have the confidence needed to start initiating it/ dishing it out. Hoping this is the season we start seeing the mean Pucker side of his game. All the BS he’s had to put up with his first 4 yrs. Payback will be a biotch, maybe even see him missing 3-6 games this season via suspension. Beauty and the beast, he can be both. I don’t think so, Hall has personally said getting into the Scrums get’s him off his game and makes him lose focus. That’s why he usually just skates away during scrums. Sort of what I meant. He doesn’t have to hang around and participate in the scrum. He can be the reason for the scrum though. I was thinking about brutality issued during play. Clutterbuck a few guys and be done with it, choose not to partake in the aftermath. Nothing wrong with a few Messier type moments to buy himself some space on the ice. Even with todays rules. Better to spend a week in Mexico in January this season, than during a possible playoff season like 2015-2016 could be. Set some ground rules during this hockey that doesn’t matter phase they’re in. This might also become a moot point if a few of the prospects can develop and play top nine roles. As before the team was small and skilled in the top nine with some plugs and enforcers down on the fourth line. But soon the team will have size throughout the line up. Hopefully this results in Edmonton being a much tougher team to play against. Watching Nurse and Chase int he Rookie tourney gave me hope. Nurse is just mean. It was never enough to pin a guy along the boards, he also had to rake him with the stick or bury a shoulder. Nothing but good things coming up through the ranks. Captain Hall. I hope the message of being strong on defense to help you have the puck more often and thus score more finds its way to Yak. Coaches can say something, but having that message come from a young player tearing up the league is far more effective. And I have to say i’m pumped about Hall noting his problems on the breakaway. I love the guy, but last year it got to the point where he’d have a breakaway (which felt like minimum 1 every 2 games) and I wasn’t even all that excited. He misses so many of them that it was like the ghost of Todd Marchant took over his body when he’s all alone. If he cashed on half of those misses he probably would have potted 10 more goals last year alone. Is there anywhere we can dig up a stat on the number of breakaways a players gets? I’d love to see those numbers. And please don’t use shootout a comp. In game breakaways and shootouts feel and are completely different. What I’m sensing from the article is Taylor is reaching the full maturity level as a person. I’m sure most of us can relate to being 18 or 19 acting like 15. And over time with lessons learned (sometimes hard ones) we can become 22 going on 32. The best part of that article, for me, was the fact he acknowledged going into battles with poor body position. It often bothered me that he falls so easily; almost to the same degree as Hartnell Down. If he has identified part of the problem and is working towards fixing it, this is music to my ears. Also, answers like this aren’t the normal broad or cliche answers, so its nice to hear something different. Agreed. The last time I heard Eberle talk about his game, it was about how goalies had a hard time tracking his shots because it apparently just ‘comes off the stick different’. Hall’s self awareness will hopefully rub off on the other guys. Perhaps Yak is sick of playing 5th fiddle to Hall, Nuge, Ebs, and Schultz. I wonder if him and Yakimov don’t have instant chemistry at main camp. I know everyone’s penciled in Draisaitl, but if the Yak’s play well together, that’s a really tough third line combo to break up for the sake of draft pedigree. …….I think he knows what I expect of him, and more importantly, what he expects of me and I think that’s good for a player like myself and for everyone that is returning. They probably feel a lot more comfortable this year than last,” said Hall. Wondering what Hall Expects of Eakins. As Hall says hopefully Eakins will be more comfortable. Copies of the interview and the Team Canada gold medal Olympic game should be given out to everyone on the team. Also, the 300. Time to go war by playing excellent defense. Crosby, Stamkos, Toews – different player grouping altogether. Agreed. I am not convinced however that the majority of GMs in the league would not send a 28-year old Ovechkin packing for a 22-year old Taylor Hall. Ovechkin is very talented. An immensely talented flake. No thanks. Ovechkin is a coach killer who plays when the spirit moves him. Hall brings it every shift. Two totally different players. Hall had the 2nd most assists in 5 on 5 play last year. Think about that for a second. Unfrickinreal. Given their PT production is near identical, but Stamkos plays C and scores G at a higher rate I doubt any GM would trade Stamkos for Hall straight up. That doesn’t mean Stamkos is on another “level” compared to Hall. It’s a very similar debate to Crosby vs Ovechkin. Love the interview. Now before we go all jump ship and say Hall needs to be the next captain for the Edmonton Oilers. I dont disagree with that claim at all but lets see him walk the walk a bit first. Its easy to say the right thing in an interview on the direction you want to go but lets see it happen first. The oilers love the ole smoke and mirror show. Lets not forget the past 5 years how we heard all the right things in the preseason got very very hyped up and then well… we know how this story ends. Are you suggesting Hall hasn’t “walked the walk” so far? Not saying hasnt been a great player. But has been a great leader so far? Look at our record, our inability to fix mistakes, the whole water bottle crap last year and another year of watching the playoffs this summer. Steps are being taken in the right direction but until we see some results this is just gum flapping. To summarize your comment: Hall plays for a terrible team so he must be bad at leading. Hall for captain? The players should decide on this among themselves. Ference has done an ok job. I wish he would keep his personal views to himself. Play hockey. For what its worth , Stamkos on his next contract will be the highest paid player in the NHL. Just wondering by playing in Tampa [ which is not the largest media market] will it cost him in outside endorsements?, unless its Tropicana orange juice. So, I posed this question earlier, and still have no answer. Does anyone have any clue, at all, how Chicago, Philly, Boston, and Tampa are going to get under the cap? I can only assume Philly is desperately trying someone, anyone, to take Lecavialier. But what are the others going to do? I know the roster looks pretty set right now but are their any players that could shake loose from those teams the Oilers would trade for? And if so, what would be the cost? I believe it was Zarny who explained this well in a former post. There is a “loophole”. Philly can go into the season as is cap wise. Too bad. but thanks you. Once you figure in the LTIR teams like Philly (Pronger) and Boston (Savard) it won’t be a problem. The may be over the cap the day before the season starts, but day 1 of the season they’ll be under it once those salaries are off the books. The other two are just a matter of having someone start the season on the injured list. Their salaries don’t count till they’re added to the roster. Virtually all teams will have injury write offs from day 1 of the season. Nobody will magically be cut loose because of this perceived issue. It’s all waiver wire pick ups if the Oilers are hoping to bring in another center or two. Phi and Bos can get under the cap simply by placing Pronger and Savard on LTIR. Phi is over the cap by Pronger’s salary almost to the penny so they can put him on LTIR on the last day of pre-season, write off 99% of his contract and get under the cap. I’m sure they are trying to trade Lecavalier, but given they can’t retain any of his salary until the season starts it’s unlikely he goes anywhere beforehand. Bos will certainly want to put Savard on LTIR after the season starts to maximize the write off. They are only $800K over so technically they could bury Dougie Hamilton in the minors to start the season, put Savard on LTIR on day 1, recall Hamilton and they are ~ $4M under the cap. They do have some overages from bonuses last year to consider though. Tampa can probably get under the cap by burying players; Chi not so much. There will be trades but they still have time. Players can get injured in pre-season (ex. Gagner) which could provide additional LTIR relief. Edmonton has potential to benefit, but Calgary, Ottawa and a few other teams are in a much better position now with considerably more cap room. I wouldn’t hold my breathe that the Oilers get a gift from one of the teams over the cap. Thanks, just read a post about the Pronger stuff. Given they are pretty close to 4.94 mill over, it seems pretty obvious which way Philly is leaning. Boston too looks pretty obvious, and as you say Tampa has options. But, it will be interesting to see what Chi does. Maybe they need the practice to get ready for next season. Philly will put Pronger on LTIR freeing up 4.9 in cap space. Boston will do same with Savard. TB will do the same with Ohlund. Issue for Boston is that even if they do that, they still might have to make a move if they want to sign Smith and Krug. Chic is talking about moving Leddy…Want to move Versteeg, but so far no takers. It seems like if this was a year ago, Oilers would have been all over Versteeg. I wonder if the upcoming talent has anything to do with Mac T’s approach to less bold moves and more not sacrificing the future. Great article and I have been waiting to hear from Hall this pre-season. Hall is so exciting every time he touches the puck and I truly wish him all the very best this coming season and to the Oilers!! Awesome! Love this player! Taking responsibility for the teams slow start?! Wow. I like it. And those three areas that he is working on, that would be amazing if those were improved. A great young player saying all the right things that is a captain material right there and is never afraid to face the media wolves. Brings me out of my seat every game he is a great watch we are lucky to have him. Hall Ebs Nuge Petry Marincin and Scrivens/Fasth will be the ones that really determine their out come. That’s 1/3 of the forward group’s ice time, almost half of the D ice time, and all the goaltending. Should those five players post a 49+ corsi rating and the goalies post a .918 or better sv% the oil could actually be competitive. Side question, what was the Oil’s record when the goalie posted a sv% similar to Varlamov’s and the posted a sh% close to Colorado’s? I think you’re forgetting Fayne. He will arguably play the largest part in turning the ship around as he will be pegged as one of the top two D pair. Even in a shut down role, if he can handle the top competition, that is a monster change from last year, as it bumps everyone down a peg. To a lesser extent, If Nikitin can not be a defensive liability and add some scoring, that is another huge boost. Finally, the PP. If the Oilers can get their PP back to top 3 while keeping an average penalty kill and stay out of the box themselves, that alone could turn the ship around. The Oilers PP was ranked 3rd in 2011-12 and they finished 29th overall. I think it’s unlikely that alone would turn the ship around. The Oilers’ goal differential last year was 3rd worst in the league at -67. That is what needs to change. Detroit was the only negative goal differential team to make the playoffs last year at -8. Min, Phi, Dal, Mtl and CBJ were +1, +1, +7, +11 and +15 respectively. Every other playoff team was +25 or higher and every single team that missed the playoffs had a negative goal differential. The Oilers PP last year scored 46 G in 271 attempts and was ranked 21st. For the PP to be tied for 3rd overall last year they only needed 13 more goals. To match the 2012-13 ranking of 8th overall the PP only needed 8 more goals. A better PP would certainly help, but the difference is marginal and the hand-wringing last year was overblown. 8-13 more goals is not going to move the needle in the standings very far. Nice to hear Hall admitting he was leading with his stick too much previously. That’s been evident in his career so far, poking that super-long stick in especially on the backcheck. A guy with his speed should be able to catch guys and use his body more instead of reaching with one hand on the stick from 8 feet away.